How can I search for other EdHero members? I am trying to find someone for collaboration. 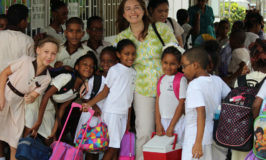 Our goal is connect educators all across the world so that they can work with each other, support each other and learn from each other. You collaborating with other educators on the EdHero platform is a key to our mission. 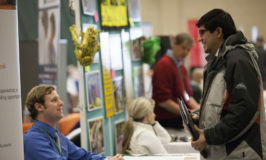 You can search a teacher based on location, zip code, area of interest, subject, grade, years of experience. From the resulting page, use the filters to filter out the teachers based on your interest and visit their profiles to learn more about them. When ready, send them a collaboration request using the “Ask for Collaboration” button present on their profiles. Fill in the details and wait for their responses. The user I sent the collaboration request is not responding. What should I do? There could be many reasons why the teacher you sent a request is not responding and the best thing you can do is wait for 1-2 days. If it was an urgent request then you can politely ask them about your collaboration request by sending the chat message. They did not check the requests that they received from you under “My Collaboration”. We are still developing a feature for automatic notifications but at this point they have to manually go and check under “My Collaborations” to see if they received any requests. They might not be using the platform anymore and in which case they might never respond. You can wait for few more days and if you don’t see a response then you need to find some other teacher to collaborate. They might be too busy and forgot to respond to you. Send them a quick chat message to check in and see if they receive the request you sent and if they have any questions. Usually, they will reply pretty quickly to your messages. 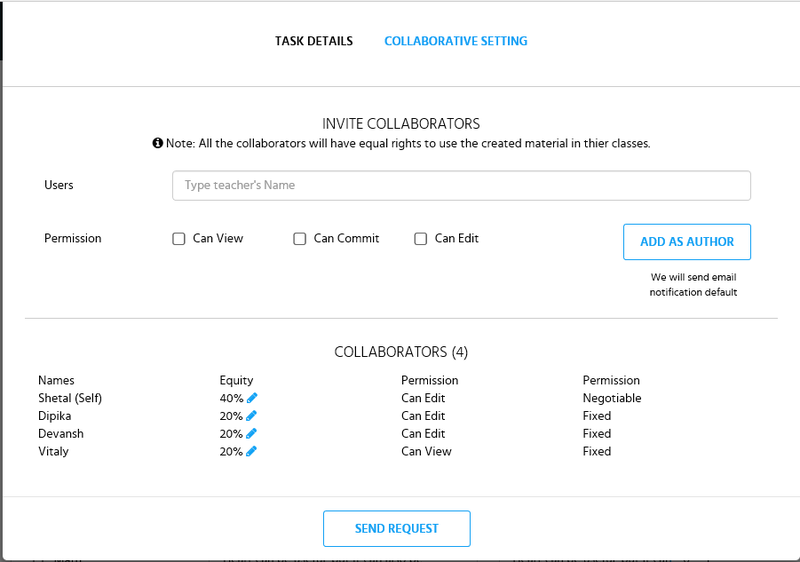 You also have the option to resend the collaboration request to teachers. I have found someone for collaboration but there is no “Ask for Collaboration” button on their profile. Why is that? Can I still ask them for collaboration? 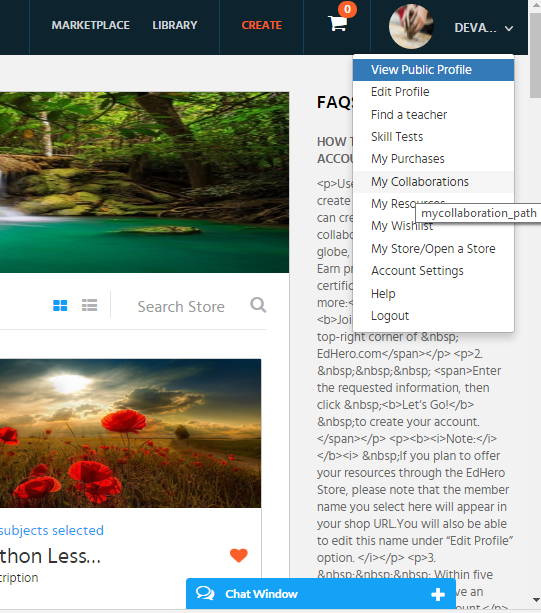 As an EdHero Star member, users have the option to hide the “Ask for Collaboration” button from their public profile. 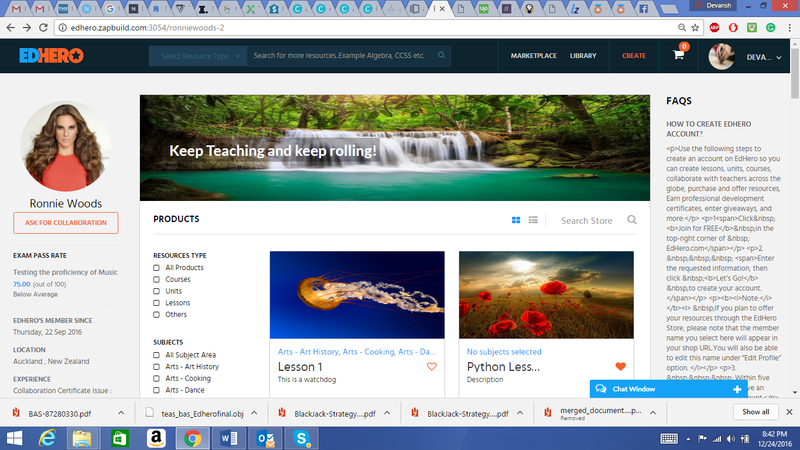 This feature comes in handy for those who are busy and cannot collaborate often or for small publishers and individual teacher sellers who are more inclined towards offering their own created resources to other teachers. Although, we want to promote collaboration we don’t want to impose on anyone and therefore we included this option in our EdHero Star membership. You can collaborate with other teachers to create engaging lessons, Units and Courses. Click on “Ask for Collaboration” present on the left side bar under the profile picture as shown in the picture below. Select the Resource type. You can either collaborate on a Lesson, Unit or a Course. 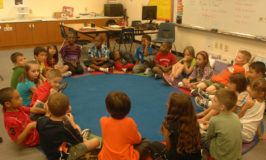 Type the name of the lesson that you want to collaborate on. Yes, you need to create the lesson before you can ask another teacher to be the co-author. If you haven’t created the lesson already then just do so quickly and give the lesson a title (this can be done using the CREATE button on the main menu bar). Return to this page and select the lesson you want to add a co-author. Fill in the details of the collaboration on the following window as shown in the picture below and click Next. Fill in the remaining details and send the request to the teacher by clicking on ADD AS AUTHOR. What are pending collaboration requests? Pending Collaboration requests are the collaboration requests sent by other users to you. In case you are unaware, with EdHero now you can collaborate with teachers across the globe for lesson planning, unit planning and course creation. You can also share the revenue when a co-authored resource is offered for sale. Where to check for the pending collaboration requests (the requests that I sent to others)? From the right side drop down menu (present on the top right corner of the screen), click on “My Collaborations”. 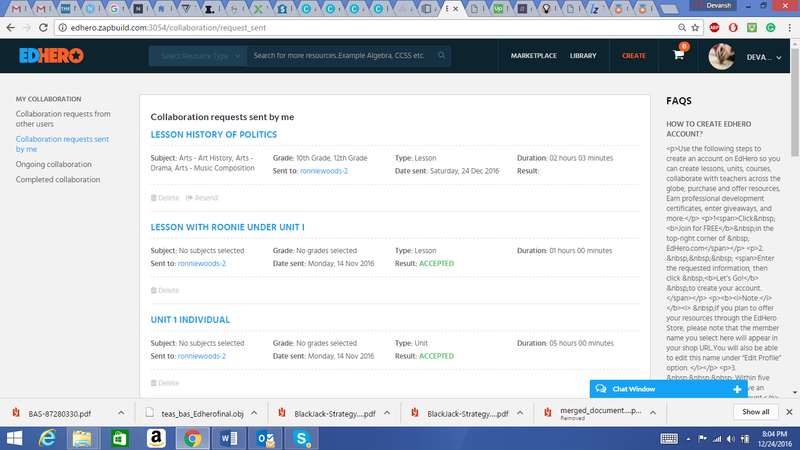 From the following screen, click on “Collaboration Requests sent by me”. Here you will be able to see all the collaboration requests (the ones you sent) which are still pending. Where to check the received collaboration requests? 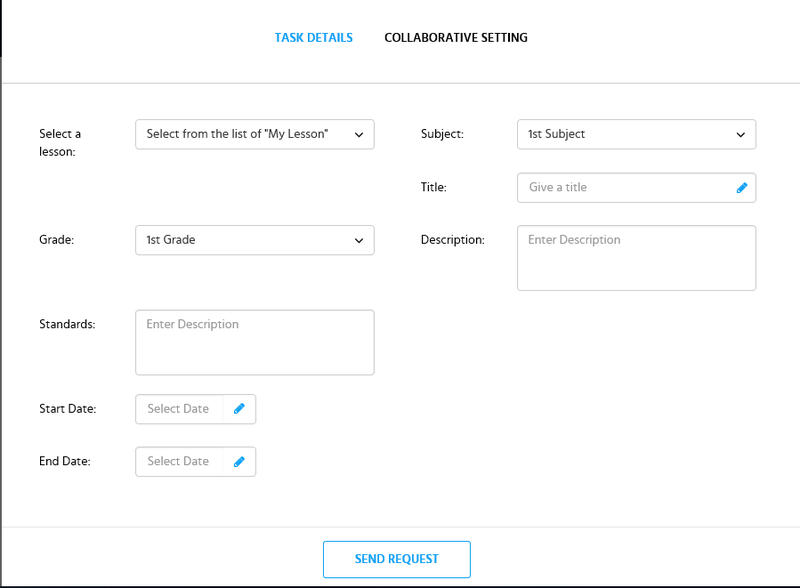 Just like you can send collaboration requests to other teachers, other teachers can send a collaboration request to you too. We recommend responding to such collaboration request in a timely manner to respect everybody’s time. 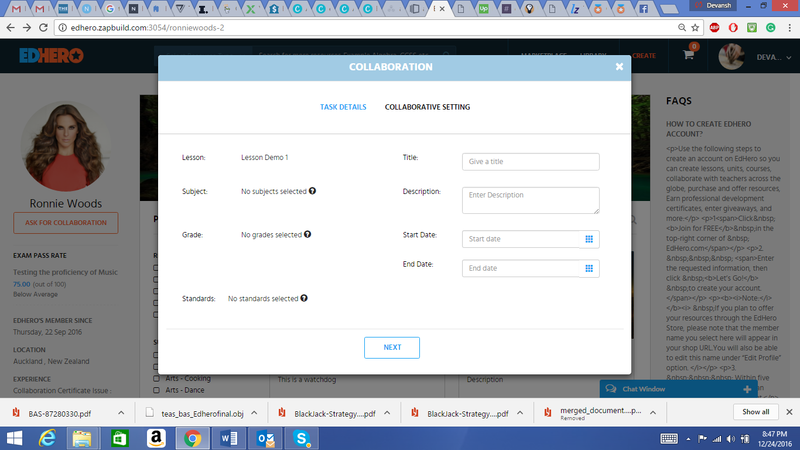 Here you will be able to see all the collaboration requests sent by others to you. You can accept the request, deny the request. Note: Clicking on “Know more” will give you more details about the collaboration including the description, standards, ownership proposal by the sender. 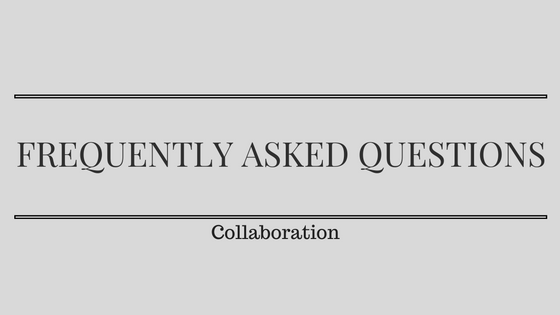 After you accepts a collaboration request the particular collaboration piece (then it be lesson, unit or course collaboration) moves under ongoing collaborations. Here you can find all your current collaborations and make changes to the collaborative piece. What are collaboration requests sent by me? 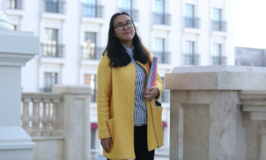 One of the main goals of EdHero is to provide teachers a secure environment where they can find each other and work with each other to co-create educational resources for their classes. It will come handy when you are in need of support and want to work with someone who just “gets it”. What happens if I don’t accept collaboration requests? 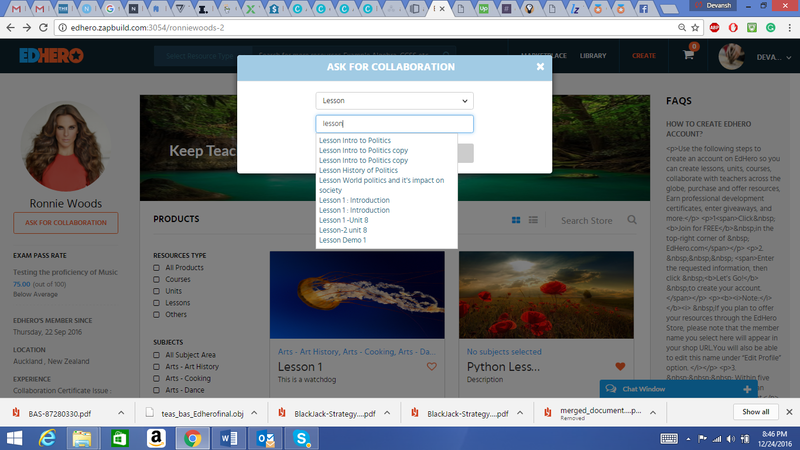 You can collaborate with anyone on the platform who has a “Ask for Collaboration” button on their profile. EdHero Star members have the option to remove the button from their profile in which case you can contact them through chat message and ask them if they would like to collaborate with you. If they have hidden themselves from the chat system then it means they are not ready to collaborate with others at this time which could be due to hard deadlines, less time, personal preference etc. 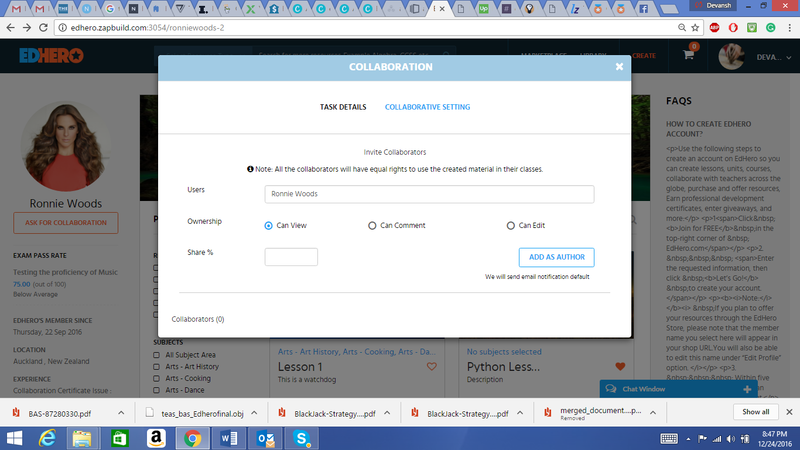 Is there anything I should know before accepting the collaboration request? Before accepting the collaboration request make sure that you have read all the description on the request. Accept it only if you feel you will be able to contribute through collaboration. In case you feel you don’t have enough time or enough expertise in that field then politely decline the request and write a brief message to the sender for declining the request as a courtesy message (you can search the sender through the chat system and write a message in the private chat box). 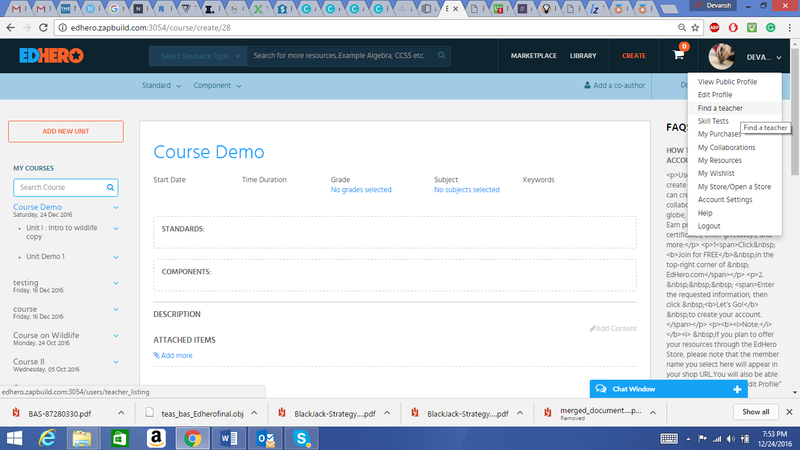 In case, you are ready to accept the request then after you accept the collaboration request, you and the person can co-create lessons, units and courses on the platform. The person who sent you the collaboration request defines the ownership equity (percentage ownership of the final output) of the document created. You can work with the collaborator(s) and nail down the ownership before proceeding further. If, in case, you don’t care about the ownership then there is nothing to worry about – you still will have access to the created resource for your class (you can download them and print them, upload them to your LMS etc.) but will not have the rights to sell it. How can I add a co-author while creating a lesson? Fill out the “Task details” section and the “Collaborative Settings” section. Click on “Send Request” once you are done entering the required details for the collaboration. How can I add a co-author to an existing lesson? Open the lesson to which you want to add the co-author. Click on the “Add a co-author” button on the top menu. The co-author will be added as soon as he/she accepts the collaborative request. How can we split the ownership of the co-created resource? At the time of sending the collaborative request the initiator can specify the ownership of the final product. If you are a co-author, you can work directly with the initiator (the one who sent you the collaboration request) and agree with the percentage ownership of the resource. Note: Irrespective of the ownership the co-authors will have the full rights to use the resource for educational purposes (that is, to use the resource in their classes). The ownership only restricts the selling of the resource and helps in revenue share between co-authors. Can I sell a co-created resource? Yes, you can sell a co-created resource and split the revenue difference with the co-authors. How is the money distributed if a co-created resource is sold? The money is distributed based on the ownership of the resource that is sold. For example, if there are 3 authors having equal ownership of the resource then the 85% of the resource sale price will be split equally between three authors and the remaining 15% will go to the EdHero platform for maintenance and new feature upgrade purposes. Note: You can have more than one co-author (on a particular resource) only if all the co-authors are EdHero Star members. If you are a free member then you can have only one co-author at a time which means you can add one co-author to a lesson that you want to create. However, it does not mean that you are restricted to only one collaboration. As a Free member, you can still have as many collaborations as you can possibly have. Keep collaborating and supporting each other.